Spotify has always been a popular app but Deezer is fast catching up. For most people, the free version is enough but, for some they need more. We now have an app called Deezer++ bringing us all the premium features. 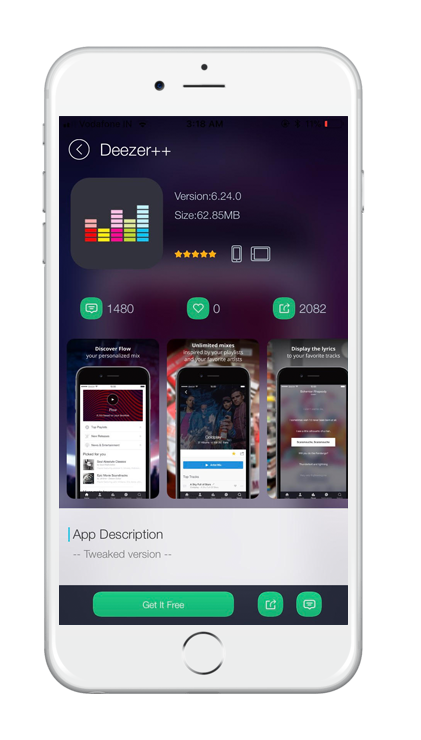 Deezer Plus is the modified version of the (original app), and it offers much more than the stock, free version of the app does. As well as all the stock features, you get all the elite and premium features. At one time you would have needed a jailbreak to get features like this but now, with Cydia not really being updated much, the developers have made the modified app work without the need for jailbreaking. Because it is a modified app, Apple will not allow it into the iOS app store. Instead, you can download it via another app called TweakBox. This is a third-party installer that offers access to a large number of apps and games . Here’s how to download it. Tap to download directly. Follow the linked guide to download TweakBox app on to your device. Wait until the app installation has finished, and you can start streaming your favorite tracks. When you download your TweakBox app , because it isn’t an official app, it will crash and stop working within a few days. This is because Apple revokes the certificates of all apps they don’t see as official. You can prevent this by installing a VPN on your phone after you finished installing your apps . This stops Apple revoking the certificates and leaves you to enjoy the app in peace. Deezer++ is an excellent music streaming app but it isn’t the only one. If you want to try something else, have a look at Spotify++. Another modified app, this one has all the free and premium features of Spotify, with no need to jailbreak. Have a look at the app and see what you think of it. If you don’t like it, you can delete it, but it is free, and you don’t have anything to lose. Don’t forget to tell us what you think of it and follow us on Facebook for more updates. The download links on this website do not work, can you get them fixed please? we are working to restore that. Deezer++ 7.1.1 we need you back!